This picture was taken last November when we were touring New Zealand and was shot from my hotel room and SOOC. AN EARTHQUAKE MEASURING 6.3 HIT CHRISTCHURCH EARLY TODAY AND CAUSED A LOT OF DAMAGE. AT LAST REPORT 65 PEOPLE HAD DIED. 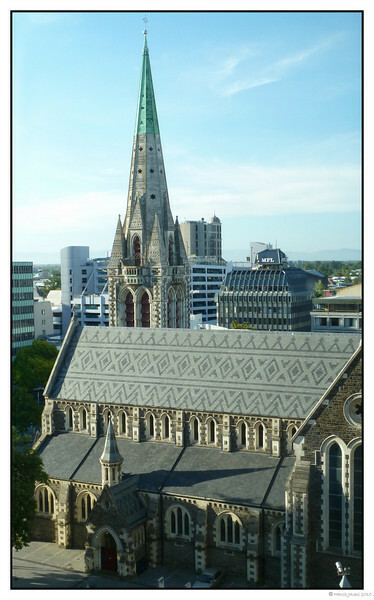 THIS BEAUTIFUL CATHEDRAL'S SPIRE WAS ALSO DAMAGED AND IS NO MORE. IT'S SUCH A SAD WAY TO START A DAY, SEEING A BEAUTIFUL MONUMENT DAMAGED SO BADLY. OUR HEARTS GO OUT FOR THE ONES AFFECTED. Beautiful building, what a sad story for it. I just saw this on the news this morning, very sad and devastating. This is very beautifully captured. I'm so glad you had this shot -- to remember what is no more. Lovely tribute. Wonderful documentation of this beautiful church. The devastation in Christ Church is so horrendous! I saw pictures of what looked like a domed chuch and the big dome has completely fallen off. It is so sad. I hope the world will rally to their aid as they have in other great disasters. Beautiful shot of this old church! So sad about the loss of life and the damaged incurred. Our thoughts and prayers are with the folks in New Zealand.